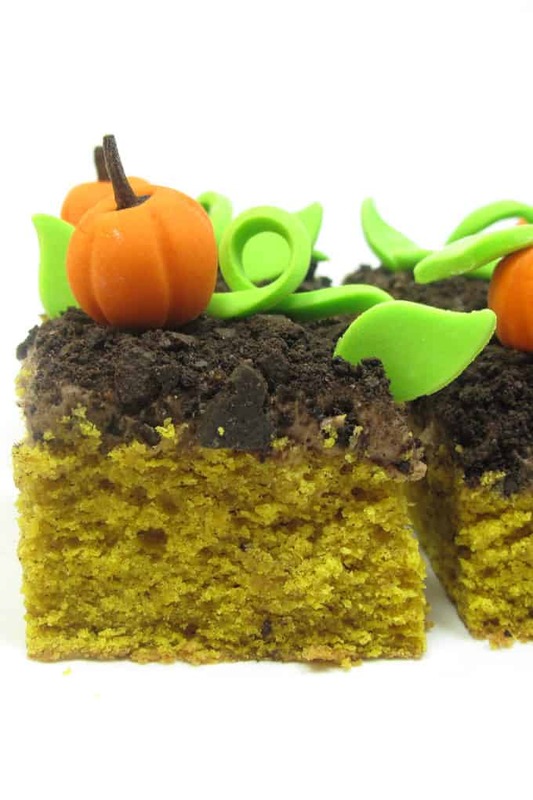 Or, pumpkin patch cake topped with chocolate cream cheese frosting, crumbled chocolate cookies and fondant decorations. Also known as, the best Fall dessert EVER. Remember that pumpkin shortage we had last year? I’m not helping matters. I went through four cans of pumpkin (I’m a Libby’s gal) for challenge 8 of Project Food Blog. And yet… I didn’t make it to Challenge 8. That’s right. 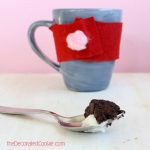 So I bid a fond farewell to the Project Food Blog contest. But I had prepared my next challenge anyway since it’s right up my alley. So I’m still going to share it with you. 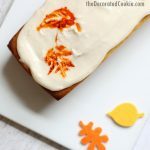 It’s a delicious pumpkin patch cake, so just right for Fall or for Thanksgiving, and the perfect combo of yummy cake with Fall decorations. 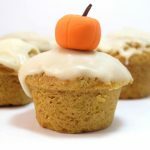 The challenge: create a sweet or savory baked good featuring pumpkin. I tried a few versions of pumpkin cut-out cookies that were… just OK. I didn’t want to settle for just OK. So then I tried cake. This one is yummy, moist, and not too heavy. The cream cheese frosting is a nice complement, and only subtly chocolate-y. So yay. I was sticking. Hey, wait a second. I see someone back there. Yep. Yep. I think it is. What’s he doing in that pumpkin patch? *The cake and frosting recipes are at the bottom of this post. Find the leaf fondant cutter (probably in a set) and fondant in the baking aisle of the craft store. For food coloring, I prefer Americolor soft gel pastes (Electric Green and Orange used here). The chocolate wafers are available in the supermarket. Check HERE for tips on finding cookie decorating supplies. Prepare the cake recipe below and let cool completely. And I mean completely. Place some chocolate wafers in a sealable plastic bag (work with about ten wafers at a time). Crush with a rolling pin or mallet over a cutting board. Set aside. Prepare the frosting recipe below and use the spatula to spread on the cake. 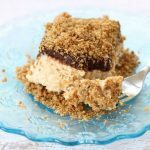 Immediately top with crushed chocolate cookies. 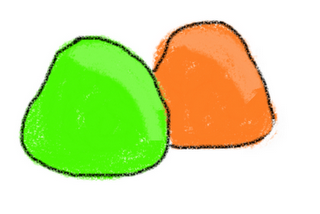 Prepare lime green and orange fondant by kneading drops of food coloring into a handful of fondant very well. 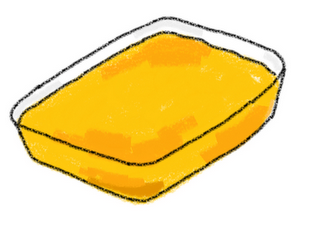 If fondant gets too sticky from overhandling, let it sit at room temperature uncovered about fifteen minutes. Start with just one or two drops of coloring and add more until desired color is achieved. 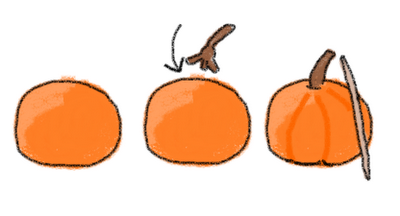 For the pumpkins: Roll a ball of orange fondant in your palms about 3/4-inch in diameter. Flatten the top and bottom slightly with your thumb and forefinger, and stick a clove in the top. Press the side of a toothpick into the fondant to make indentations on the sides. Prepare 25 to 30 pumpkins, or as many as desired. For the leaves:Roll lime green fondant thinly on a surface lightly dusted with confectioner’s sugar to prevent sticking. Cut out leaf shapes and set aside. If desired, attach to the tops of a couple pumpkins with a dab of water. Cut out about 50 leaves, or as many as desired. 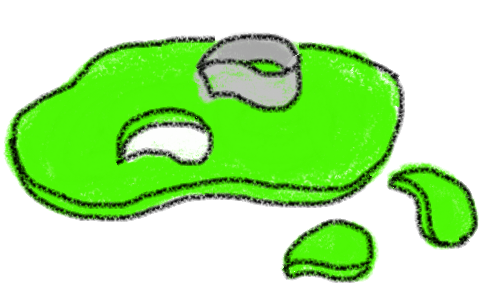 Reserve some lime green fondant and wrap well. You will need more for the vines in step four. With a sharp knife cleaned frequently, cut cake into 2-inch squares and arrange on a platter or cake stand. Roll out the green fondant as in step three. Use the pizza cutter to cut out strips about 3/8-inch thick and 4-inches long. Gently pinch along the length of the vine to rid of sharp edges, then loop and bend vines. 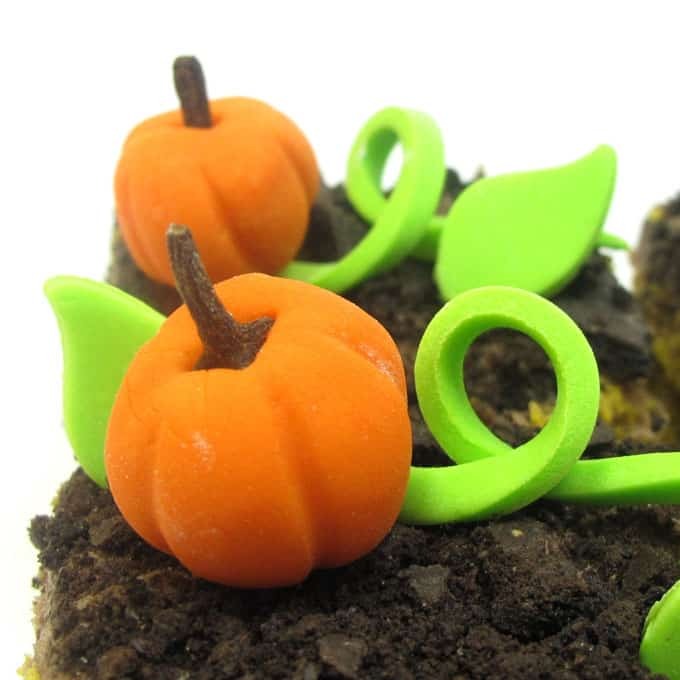 To arrange on each piece of cake, tuck one end of a vine into frosting to secure, and place a pumpkin on the other end, gently pressing into frosting. Insert leaves as desired. Briefly whisk together flour, spices, baking powder, baking soda and salt in a bowl and set aside. Cream the butter in a standing mixer with the flat beater (or with an electric hand mixer). Add the sugar and blend well. Add the pumpkin, egg and vanilla extract and blend well. Gradually add the flour mixture, mixing well. Spread into a greased 9 x 13 inch baking dish and bake in a preheated 375 degree oven for 25 to 30 minutes until a toothpick comes out clean. Let cool completely. Yields: about 28 squares. Blend the cream cheese and butter. Add confectioner’s sugar and blend well. Add cocoa powder and vanilla and blend. Brilliant! This is so so cute! I am totally shocked that you didn't advance to the next round, I watched a good number of the videos and yours was by far the most creative and best! You are still OUR FAVORITE food blogger of all time. I loved your marshmallow video. It was one of my favorites! I need to go see who made it through because all the people I voted for did not go to round 8! I love your pumpkin cake! Just, adorable. I cannot believe the news. Your video was great. I don't know why it didn't make it. 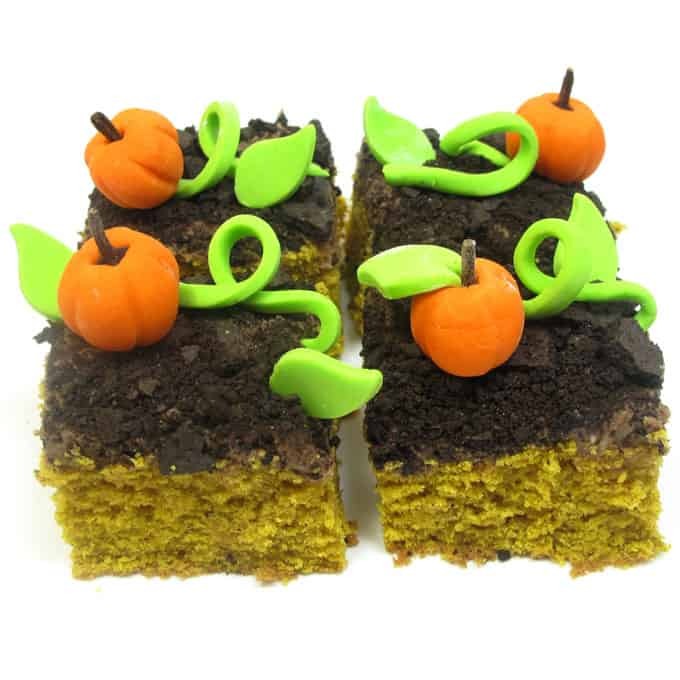 I love the pumpkin patch cake also. I love your site and continue to read it frequently! I can't believe you didn't make it! I'm absolutely shocked – your video was so cute and creative! i love the little illustrations to go with your directions! Aw boo, sorry to hear you didn't make it through! Glad you posted the pumpkin cake though, it's gorgeous! Your cake is so cute! And I'm sorry you didn't advance to the next round. I loved your video (in fact that's how I discovered your lovely blog). That is so cute. I would like to try this one since it is so easy and simple. I just hope that my friends like this when I bake some. Thanks for sharing. Oh, I'm so sorry! I loved all of your original posts! You should be proud and I think only good things can come of it! You should be very proud that you advanced to round 7 in the competition. I admire everyone who had the nerve to enter. 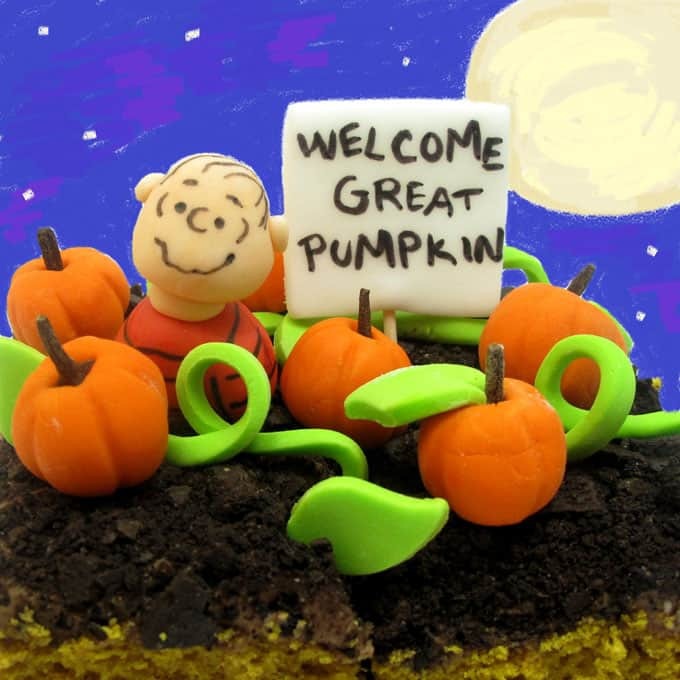 Your Pumpkin Patch Cake is adorable, love your fondant work. Brilliantly creative and fabulous post. Well done! That is so cute the idea …congratulation.